ByManuel Carreiras, Charles Clifton, Jr. This book addresses important findings, assumptions, problems, hopes, and future guidelines on the use of advanced research techniques to study the moment-by-moment mental processes that occur while a reader or listener is understanding language. The core techniques are eye tracking and ERPs, with some extensions to others such as fMRI. 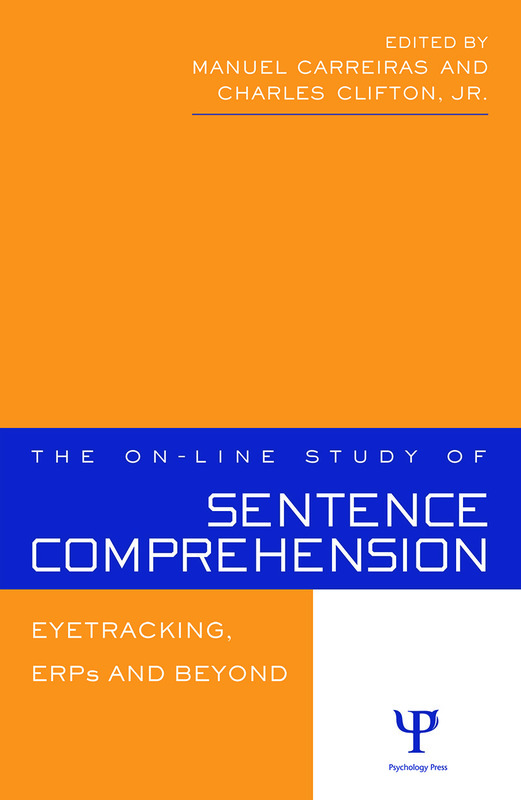 The On-line Study of Sentence Comprehension has been written by top researchers in the field of psycholinguistics, who are also leading experts in the use of eye tracking and ERPs. This book combines comprehensive overviews of the state of the art on theoretical progress, the latest on assumptions behind the use of eye movements (reading and visual world) and ERPs methods with papers that address specific research questions. This work covers not only methodological issues but also discusses the theoretical progress in understanding language processing using temporally fine-grained methods. M. Carreiras, C. Clifton, Jr., On the On-line Study of Language Comprehension. D.C. Mitchell, On-line Methods in Language Processing: Introduction and Historical Review. M.J. Pickering, S. Frisson, B. McElree, M.J. Traxler, Eye Movements and Semantic Composition. J.E. Boland, Linking Eye Movements to Sentence Comprehension in Reading and Listening. S.A. McDonald, R.C. Shillcock, Lexical Predictability Effects on Eye Fixations During Reading. M. Betancort, E. Meseguer, M. Carreiras, The Empty Category PRO: Processing What Can't Be Seen. R.P.G. van Gompel, S.P. Liversedge, J. Pearson, Antecedent Typicality Effects in the Processing of Noun Phrase Anaphors. P.C. Gordon, C. Christine Camblin, T.Y. Swaab, On-line Measures of Coreferential Processing. A.J. Sanford, P. Sturt, L. Moxey, L. Morrow, C. Emmott, Production and Comprehension Measures in Assessing Plural Object Formation. C. Scheepers, M.W. Crocker, Constituent Order Priming from Reading to Listening: A Visual-world Study. F. Huettig, G.T.M. Altmann, The Online Processing of Ambiguous and Unambiguous Words in Context: Evidence from Head-mounted Eye-tracking. S. Brown-Schmidt, D.K. Byron, M.K. Tanenhaus, That's Not It and It is Not That: Reference Resolution and Conceptual Composites. J.J.A. van Berkum, Sentence Comprehension in a Wider Discourse: Can We Use ERPs to Keep Track of Things? L. Osterhout, J. McLaughlin, A. Kim, R. Greenwald, K. Inoue, Sentences in the Brain: Event-related Potentials as Real-time Reflections of Sentence Comprehension and Language Learning. H. Barber, E. Salillas, M. Carreiras, Gender or Genders Agreement? M. Hoen, P.F. Dominey, Evidence for a Shared Mechanism in Linguistic and Non-linguistic Sequence Processing? ERP Recordings of Online Function- and Content-information Integration. C.J. Fiebach, M. Schlesewsky, I.D. Bornkessel, A.D. Friederici, Distinct Neural Correlates of Legal and Illegal Word Order Variations in German: How can fMRI Inform Cognitive Models of Sentence Processing? M.K. Tanenhaus, On-line Sentence Processing: Past, Present and Future.